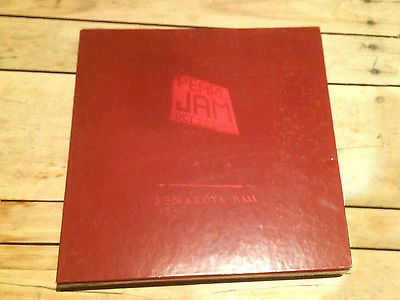 All hail Vedder - Pearl Jam - Live at Benaroya Hall - 2004 - 10/22/03USA pressing. The grail. This record set needs no introduction. An amazingconcert in 2003, committed to 4 beautiful lp's in purple. And housed in a striking box, hand numbered of 2000, only available through Ten Club. The sound on these areoutstanding. This is number 1681. Opened and only looked at and played once. The box is VG+ Nice shape. Some faint rubbing to the printing but not severe. Theres a slighthairline split to theprinting on the spin as pictured. As well as a smallcorner ding as pictured. Otherwise very nice. The inner sleeves are all great NMshape. Vinyl is also NM played only once. Includes original poster in NM shape as well. 100% original Records kept in heavy protective sleeves since day 1. Only played on an audiophile set-up.This is from my personal collection. Watch for many more rare 80's, 90's alternative, rock, indie, to current day finds in the upcoming weeks Led Zeppelin, Classic Records, Pearl Jam, Nirvana, Daft Punk, Smashing Pumpkins, NIN, Oasis, U2, Killers, etc. I Will ship anywhere!! !SHIPPING ANYWHERE IS OBVIOUSLY NOT $4. PLEASE NOTE - shipping for this given weight may be veryexpensive to some areas. Please check in advance. Sorry for the confusion but the ebay rate calculator doesn't work properly for shipping rates from Canada - Paypal accepted. All payments made within 5 days of auction close. USA and international bidders very welcome. Shipping to be paid by buyer. Local pick-ups are encouraged. Will be calculated at auction close. ALL SHIPPING AS CALCULATED BY CANADA POST RATES. USA is usually $11 for 1 LP, $16 for a double LP. Air shipping to Europe and UK on average is $19 for single lp and $38 for 2lp. Combined orders calculated as such. AUCTIONS THAT REACH OR EXCEED $75 will be STRONGLY URGED TO SEND VIA TRACKED/EXPEDITED SERVICE.All vinyl shipped carefully in proper record mailers. I AM NOT RESPONSIBLE FOR UNINSURED PACKAGES. Happy bidding. Cheers.